Red / Pink Ricordea Mushrooms are quite a sought out group of mushroom corals for the marine aquariums. Red / Pink Ricordea Mushrooms are very beautiful and create marked impact to the display of a marine aquarium. One of the rare species, Red / Pink Ricordea Mushrooms, is worth the price it is available at. Other names: Red / Pink Ricordea Mushrooms belong to the Order Corallimorpharia, Family Ricordeidae and Genus Ricordea. The scientific name of Red / Pink Ricordea Mushrooms is Ricordea yuma. Red / Pink Ricordea Mushrooms are also commonly known as Red / Pink Disc Anemones. Coral Type: Red / Pink Ricordea Mushrooms are considered as hard corals due to their close resemblance to stony corals. Origin or natural range: Red / Pink Ricordea Mushrooms originate from the Indo-Pacific region. Color: As the name suggests, Red / Pink Ricordea Mushrooms are available in the color variations of red and pink. Morphology: Red / Pink Ricordea Mushrooms are round in shape. Ricordea yuma has one mouth. Red / Pink Ricordea Mushrooms have pseudo tentacles on their oral cone. Ricordea yuma has many beads like sacs on them. Red / Pink Ricordea Mushrooms have proteins which are fluorescent red in color. That is how Ricordea yuma gains the color red or pink. As a standard rule, the appearance of Red / Pink Ricordea Mushrooms varies according to the changes in their environment. Compatibility: Red / Pink Ricordea Mushrooms are relatively less aggressive as compared to the other marine aquarium invertebrates. Breeding: Red / Pink Ricordea Mushrooms breed well if your marine aquarium environment meets their conditional requirements. Ricordea yuma reproduces asexually by the means of vertical division, scientifically called as longitudinal fission. Temperature: Red / Pink Ricordea Mushrooms need your marine aquarium water temperature to be in the range of 72 to 80 degrees Fahrenheit. Specific gravity: The specific gravity of the water in your marine aquarium containing Red / Pink Ricordea Mushrooms should read 1.023 to 1.025.
pH: The pH of the water in your reef tank should be maintained between 8.10 and 8.40 to the comfort of Red / Pink Ricordea Mushrooms. Illumination: Red / Pink Ricordea Mushrooms require moderate light. Fluorescent actinic illumination helps deepen the color of the Red / Pink Ricordea Mushrooms. However, Metal Halide lighting is recommended for your marine aquarium having Ricordea yuma. Water flow in the aquarium: Red / Pink Ricordea Mushrooms require a low to moderate flow of water in the aquarium. Marine aquarium habit & habitat: Place Ricordea yuma at the bottom of your reef tank, for the initial few weeks till they open up fully. Once they are open, you can place them anywhere. Ideally, place Red / Pink Ricordea Mushrooms on a rock in the bottom of your marine aquarium. 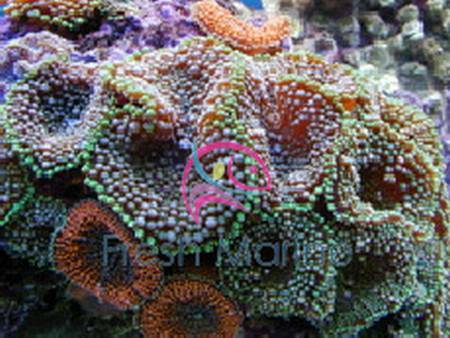 Maintain enough distance between Red / Pink Ricordea Mushrooms and the other corals in your marine aquarium. Feeding and Nutrition: Red / Pink Ricordea mushrooms symbiotically host photosynthetic algae, zooxanthellae. The alga performs photosynthesis from which Ricordea yuma derives its nutrition. Red / Pink Ricordea Mushrooms may also filter feed upon very small marine crustacean invertebrates, marine snow, phytoplankton and zooplankton. An occasional feed of meaty bits catalyzes the growth of Red / Pink Ricordea Mushrooms in your marine aquarium. Add Iodine and trace elements in your marine aquarium water as a dietary supplement for the Red / Pink Ricordea Mushrooms. Care: Red / Pink Ricordea Mushrooms are easy to maintain.